(a) IN GENERAL.—Whenever a claim of a patent is invalid the remaining claims shall not thereby be rendered invalid. A patentee, whether of the whole or any sectional interest therein, may, on payment of the fee required by law, make disclaimer of any complete claim, stating therein the extent of his interest in such patent. Such disclaimer shall be in writing and recorded in the Patent and Trademark Office, and it shall thereafter be considered as part of the original patent to the extent of the interest possessed by the disclaimant and by those claiming under him. (b) ADDITIONAL DISCLAIMER OR DEDICATION.—In the manner set forth in subsection (a), any patentee or applicant may disclaim or dedicate to the public the entire term, or any terminal part of the term, of the patent granted or to be granted. 37 C.F.R. 1.321 Statutory disclaimers, including terminal disclaimers. (4) Be accompanied by the fee set forth in § 1.20(d). (3) Include a provision that any patent granted on that application or any patent subject to the reexamination proceeding shall be enforceable only for and during such period that said patent is commonly owned with the application or patent which formed the basis for the judicially created double patenting. (3) Include a provision waiving the right to separately enforce any patent granted on that application or any patent subject to the reexamination proceeding and the patent or any patent granted on the application which formed the basis for the double patenting, and that any patent granted on that application or any patent subject to the reexamination proceeding shall be enforceable only for and during such period that said patent and the patent, or any patent granted on the application, which formed the basis for the double patenting are not separately enforced. Pre-AIA 37 C.F.R. 1.321 Statutory disclaimers, including terminal disclaimers. 35 U.S.C. 253(a) corresponds to the provisions of pre-AIA 35 U.S.C. 253, first paragraph except that the first sentence of pre-AIA 35 U.S.C. 251 includes the phrase "without any deceptive intention" between "Whenever" and "a claim." Effective September 16, 2012, Public Law 112-29, sec. 20, 125 Stat. 284 (Leahy-Smith America Invents Act (AIA)), amended 35 U.S.C. 253 to eliminate the "without any deceptive intention" clause. 35 U.S.C. 253(b) corresponds to the provisions of pre-AIA 35 U.S.C. 253, second paragraph. A disclaimer is a statement filed by an owner (in part or in entirety) of a patent or of a patent to be granted (i.e., an application), in which said owner relinquishes certain legal rights to the patent. The owner of a patent or an application is the original inventor(s) who has/have not assigned away their rights or the assignee(s) of the original inventor(s), or a combination of the two. The patent or application is assigned by one assignment or by multiple assignments which establish a chain of title from the inventor(s) to the assignee(s). There are two types of disclaimers: a statutory disclaimer and a terminal disclaimer. A statutory disclaimer is a statement in which a patent owner relinquishes legal rights to one or more claims of a patent. A terminal disclaimer is a statement in which a patentee or applicant disclaims or dedicates to the public the entire term or any terminal part of the term of a patent or patent to be granted (filed in an application). Although a statutory disclaimer and a terminal disclaimer are both provided for by statute, the manner in which the two terms have been used historically distinguishes them. The phrase "statutory disclaimer" is used to denote a disclaimer of one or more claims of an issued patent whereas the phrase "terminal disclaimer" is used to denote a disclaimer of the entire term or any terminal part of the term of a patent or a patent to be granted. Under 35 U.S.C. 253(a) and 37 CFR 1.321(a), the owner of a patent may disclaim a complete claim or claims of the patent. This may result from a lawsuit or because the patent owner has reason to believe that the claim or claims are too broad or otherwise invalid. If the patent is involved in an interference or a trial before the Patent Trial and Appeal Board (PTAB), see 37 CFR 41.127(a) and 37 CFR 42.80. As noted above, a statutory disclaimer is a statement in which a patent owner relinquishes legal rights to one or more complete claims of a patent. A statutory disclaimer is not, however, a vehicle for adding or amending claims, because there is no provision for such in the statute (35 U.S.C. 253 ) nor the rules (37 CFR 1.321 ). Thus, claims of a patent cannot be disclaimed in favor of new claims to be added to the patent or an amendment to existing claims. 35 U.S.C. 253(b) and 37 CFR 1.321(a) and (b) also provide for the filing by a patentee or applicant of a terminal disclaimer which disclaims or dedicates to the public the entire term or any terminal part of the term of a patent or patent to be granted. 37 CFR 1.321(c) specifically provides for the filing of a terminal disclaimer in an application or a reexamination proceeding for the purpose of overcoming a nonstatutory double patenting rejection. See MPEP § 804.02. 37 CFR 1.321(d) specifically provides for the filing of a terminal disclaimer in an application or a reexamination proceeding for the purpose of overcoming a nonstatutory double patenting rejection based on a U.S. patent or application that is not commonly owned but was disqualified pursuant to either 37 CFR 1.104(c)(4)(ii) or 1.104(c)(5)(ii) as the result of activities undertaken within the scope of a joint research agreement. Pursuant to 37 CFR 1.321(a) and pre-AIA 37 CFR 1.321(a), a statutory disclaimer or a terminal disclaimer filed in a patent or a reexamination proceeding must be signed by either (1) the patentee (the assignee, the inventor(s) if the patent is not assigned, or the assignee and the inventors who have ownership interest if the patent is assigned-in-part), or (2) an attorney or agent of record. A registered practitioner acting in a representative capacity under 37 CFR 1.34 is not permitted to sign the disclaimer. Where the attorney or agent of record signs the disclaimer, there is no need to comply with 37 CFR 3.73. For a terminal disclaimer filed under 37 CFR 1.321(c) or (d) in a reexamination proceeding to obviate a nonstatutory double patenting rejection, the terminal disclaimer must be signed in accordance with 37 CFR 1.321(a)(1). 37 CFR 1.321(b) and pre-AIA 37 CFR 1.321(b)(1) set forth the signature requirements for a terminal disclaimer filed in an application. For a terminal disclaimer filed under 37 CFR 1.321(c) or (d) in an application to obviate a nonstatutory double patenting rejection, the terminal disclaimer must be signed in accordance with 37 CFR 1.321(b)(1). Note that the signature requirements for terminal disclaimers filed in a pending application differ depending on the filing date of the application (compare 37 CFR 1.321(b)(1) with pre-AIA 37 CFR 1.321(b)(1) reproduced above). If the application filing date is on or after September 16, 2012, see subsection 1., below; if the application was filed was filed before September 16, 2012, see subsection 2., below. Note that the signature on the disclaimer need not be an original signature. Pursuant to 37 CFR 1.4(d)(1)(ii), the submitted disclaimer can be a copy, such as a photocopy or facsimile transmission of an original disclaimer. A terminal disclaimer filed in a pending application that was filed on or after September 16, 2012 must be signed by the applicant or an attorney or agent of record. See 37 CFR 1.321(b)(1). The word "applicant," in this context, refers to the inventor or all of the joint inventors, or to the person applying for a patent as provided in 37 CFR 1.43, 1.45, or 1.46. Under 37 CFR 1.43, "applicant" refers to the legal representative of a deceased or legally incapacitated inventor. Under 37 CFR 1.45, "applicant" refers to the inventors; if fewer than all joint inventors are applying for a patent as provided in 37 CFR 1.45, the phrase "the applicant" means the joint inventors who are applying for the patent without the omitted inventor(s). Under 37 CFR 1.46, "applicant" refers to the assignee, the person to whom the inventor is under an obligation to assign the invention, or the person who otherwise shows sufficient proprietary interest in the matter, who is applying for a patent under 37 CFR 1.46 and not the inventor. An assignee who is not an applicant must file a request to change the applicant under 37 CFR 1.46(c), including an application data sheet under 37 CFR 1.76 specifying the applicant in the application information section, and a 37 CFR 3.73(c) statement to become the 37 CFR 1.321(b)(1) applicant in order to file and sign a terminal disclaimer. In order to obviate a non-statutory double patenting rejection, the entirety of the ownership must sign the terminal disclaimer disclaiming with respect to the reference on which the rejection is based, or multiple terminal disclaimers so disclaiming. Thus, if a 37 CFR 1.321(b)(1) applicant who is not the owner (e.g., an inventor who assigned away the rights to the application) signs a terminal disclaimer, the terminal disclaimer will not be entered and the non-statutory double patenting rejection will not be withdrawn by the examiner. The same is true if a 37 CFR 1.321(b)(1) applicant representing less than the entirety of the ownership (see 37 CFR 1.42(c) ) signs a terminal disclaimer, and a terminal disclaimer from the remainder of the ownership has not also been filed. The terminal disclaimer may also be filed by an attorney or agent of record (a registered practitioner acting in a representative capacity under 37 CFR 1.34 is not permitted to sign the disclaimer). Where the attorney or agent of record signs the disclaimer, there is no need to comply with 37 CFR 3.73. (4) an attorney or agent of record. See pre-AIA 37 CFR 1.321(b)(1). (2) specifying in the record of the application or patent where such evidence is recorded in the Office (e.g., reel and frame number, etc.). The submission with respect to pre-AIA 37 CFR 3.73(b) to establish ownership must be signed by a party authorized to act on behalf of the assignee. See also MPEP § 324 as to compliance with pre-AIA 37 CFR 3.73(b). A copy of the "Statement Under 37 CFR 3.73(b)," which is reproduced in MPEP § 324, may be sent by the examiner to applicant to provide an acceptable way to comply with the requirements of pre-AIA 37 CFR 3.73(b). A statement of assignee interest in a terminal disclaimer that "A and B are the owners of 100% of the instant application..." is sufficient to satisfy the pre-AIA 37 CFR 1.321(b)(3) requirement that a terminal disclaimer "state the present extent of applicant’s or assignee’s ownership interest in the patent to be granted." Although the quoted statement does not identify what specific percentage is owned by A and what specific percentage is owned by B, the statement does provide consent to the terminal disclaimer by the entirety of the ownership of the application (A and B own all of the invention, regardless of the individual percentages they own). (E) Providing a certificate of correction for patents when the terminal disclaimer was entered during the pendency of the application but the statement indicating that the patent is subject to a terminal disclaimer was not printed on the title page of the patent and/or the asterisk associated with the statement was not placed before the patent issue date in the right hand corner. The Office provides for the submission of eTerminal Disclaimers (eTDs) via EFS-Web. A web-based eTD may be filled out completely online using web-screens. An eTD that meets all requirements is auto-processed, approved immediately upon submission, and directly loads into the USPTO databases which will increase accuracy and facilitate faster processing. Note that eTDs are accepted only for nonprovisional utility applications (including national stage and reissue) and design applications (including reissue). Requests for terminal disclaimers for plant patent applications, reexaminations, and terminal disclaimers based on a joint research agreement must be filed by paper or a scanned image PDF submitted via EFS-Web. For more information about eTerminal Disclaimers, refer to www.uspto.gov/patents/process/file/efs/guidance/e TD-info-I.jsp. (C) Where the terminal disclaimer is not acceptable, indicate the nature of the informalities so that the examiner can inform applicant in the next Office action. The paralegal completes a Terminal Disclaimer review decision form to notify the examiner of the nature of any informalities in the terminal disclaimer. The examiner should notify the applicant of the informalities in the next Office action, or by interview with applicant if such will expedite prosecution of the application. A proper terminal disclaimer must disclaim the terminal part of the statutory term of any patent granted on the application being examined (or the statutory term of the patent) which would extend beyond the expiration date of the full statutory term, shortened by any terminal disclaimer, of the patent (or of any patent granted on the application) to which the disclaimer is directed. Note the exculpatory language in the second paragraph of the sample terminal disclaimer forms, PTO/SB/25, PTO/SB/25a, PTO/SB/26, PTO/SB/26a, PTO/AIA/25, and PTO/AIA/26, provided at the end of this Chapter. That language ("In making the above disclaimer, the owner does not disclaim...") is permissible in a terminal disclaimer. A terminal disclaimer must state that the agreement is to run with any patent granted on the application being examined and is to be binding upon the grantee, its successors, or assigns. A terminal disclaimer filed to obviate a nonstatutory double patenting rejection based on a commonly owned reference patent or application must comply with the requirements of 37 CFR 1.321(c). The terminal disclaimer must state that any patent granted on the application being examined will be enforceable only for and during the period that it and the reference patent or any patent granted on the reference application are commonly owned. See MPEP § 706.02(1)(2) for examples of common ownership, or lack thereof. A terminal disclaimer filed under 37 CFR 1.321(c) or (d) after the expiration of the reference patent is not effective to obviate a nonstatutory double patenting rejection. See Boehringer Ingelheim Int’l v. Barr Laboratories, 592 F.3d 1340, 93 USPQ2d 1417, 1422-23 (Fed. Cir. 2010) (The Federal Circuit found a terminal disclaimer filed in a patent to overcome double patenting based upon an expired parent patent was not effective. Specifically, the court stated: "By failing to terminally disclaim a later patent prior to the expiration of an earlier related patent, a patentee enjoys an unjustified advantage—a purported time extension of the right to exclude from the date of the expiration of the earlier patent. The patentee cannot undo this unjustified timewise extension by retroactively disclaiming the term of the later patent because it has already enjoyed rights that it seeks to disclaim. Permitting such a retroactive terminal disclaimer would be inconsistent with '[t]he fundamental reason' for obviousness-type double patenting, namely, 'to prevent unjustified timewise extension of the right to exclude.'" (quoting In re Van Ornum, 686 F.2d 937, 943-44, 214 USPQ 761, 766 (CCPA 1982) (emphasis removed))). A terminal disclaimer filed to obviate a nonstatutory double patenting rejection based on a non-commonly owned patent or application disqualified under 35 U.S.C. 102(b)(2)(C) or under pre-AIA 35 U.S.C. 103(c) as a result of activities undertaken within the scope of a joint research agreement under 35 U.S.C. 102(c) or pre-AIA 35 U.S.C. 103(c)(2) and (3) must comply with 37 CFR 1.321(d), which sets forth signature, waiver rights and enforceability requirements. (2) agreeing that any patent granted on that application or patent being reexamined shall be enforceable only for and during such period that said patent and the reference patent, or any patent granted on the reference application, which formed the basis for the double patenting are not separately enforced. The appropriate one of form paragraphs 14.27.04.fti to 14.27.08 (reproduced below) may be used to provide applicant or patent owner with an example of acceptable terminal disclaimer language. Additionally, copies of forms PTO/SB/25, PTO/SB/25a, PTO/SB/26, PTO/SB/26a, PTO/AIA/25, and PTO/AIA/26 (provided at the end of this Chapter) may be attached to the Office action to provide sample terminal disclaimers. Pursuant to 35 U.S.C. 253(b), "any patentee or applicant may disclaim or dedicate to the public... any terminal part of the term, of the patent granted or to be granted." Accordingly, the disclaimer must be of a terminal portion of the term of the entire patent to be granted. A disclaimer of a terminal portion of the term of an individual claim, or individual claims will not be accepted. A disclaimer of the term of individual claims would not be appropriate because the claims of a pending application or proceeding are subject to cancellation, amendment, or renumbering. It is further noted that the statute does not provide for conditional disclaimers (whether they are terminal disclaimers or statutory disclaimers). Accordingly, a proposed disclaimer that is made contingent on the allowance of certain claims or the granting of a petition, is improper and cannot be accepted. The disclaimer should identify the disclaimant and their interest in the application and should specify the date when the disclaimer is to become effective. A terminal disclaimer filed to obviate a nonstatutory double patenting rejection is effective only with respect to the application or patent identified in the disclaimer unless by its terms it extends to continuing applications (in which case, applicant must file a copy of the disclaimer in the continuing application, to obviate any nonstatutory double patenting rejection to which the disclaimer is directed). See President and Fellows of Harvard College v. Rea, No. 1:12-CV-1034, 2013 WL 2152635 (E.D.Va. May 15, 2013). For example, a terminal disclaimer filed in a parent application normally has no effect on a continuing application claiming filing date benefits of the parent application under 35 U.S.C. 120. A terminal disclaimer filed in a parent application to obviate a nonstatutory double patenting rejection does, however, carry over to a continued prosecution application (CPA) filed under 37 CFR 1.53(d) (effective July 14, 2003, CPAs are only available in design applications). The terminal disclaimer filed in the parent application carries over because the CPA retains the same application number as the parent application, i.e., the application number to which the previously filed terminal disclaimer is directed. If applicant does not want the terminal disclaimer to carry over to the CPA, applicant must file a petition under 37 CFR 1.182, along with the required petition fee, requesting the terminal disclaimer filed in the parent application not be carried over to the CPA; see below "Withdrawing a Terminal Disclaimer" (paragraph "A. Before Issuance of Patent"). If applicant files a Request for Continued Examination (RCE) of an application under 37 CFR 1.114 (which can be filed on or after May 29, 2000 for an application filed on or after June 8, 1995), any terminal disclaimer present will continue to operate, because a new application has not been filed, but rather prosecution has been continued in the existing application. A petition under 37 CFR 1.182, along with the required petition fee, may be filed, if withdrawal of the terminal disclaimer is to be requested. Reexamination proceedings: A reexamination is a proceeding in the issued patent. Therefore, if a terminal disclaimer was filed during prosecution of the application which resulted in the patent under reexamination, the terminal disclaimer will continue to operate. Reissue applications: Where a terminal disclaimer was filed and approved in an original application, a copy of that terminal disclaimer is not required to be filed by applicant in the reissue application. An internal review form will be filled out to indicate that a terminal disclaimer has been filed for the patent (and will be effective for the patent as it will be reissued). The internal review form will be added to the reissue application file prior to allowance. A copy of the terminal disclaimer will not be placed into the reissue application file history and the front page of the reissue patent, when issued, will not indicate that the patent is subject to a terminal disclaimer (except if a different terminal disclaimer is filed in the reissue application). However, as stated above, the terminal disclaimer will be effective for the reissued patent. In some instances a terminal disclaimer filed to obviate a nonstatutory double patenting rejection will identify the wrong reference application or patent (i.e., an application or patent which is not the basis for the double patenting rejection). In these instances, a replacement terminal disclaimer identifying the correct reference application or patent would be required by the examiner. Once a correct replacement terminal disclaimer is received, the next Office action should make it clear that "the second terminal disclaimer replaces the first terminal disclaimer, and the first terminal disclaimer is thus void." A second terminal disclaimer fee should not be assessed/charged, because the first fee is applied to the second terminal disclaimer. An examiner may become aware of two or more copending applications that were filed by the same inventive entity, different inventive entities having a common inventor, a common applicant, and/or a common owner/assignee, or that claim an invention resulting from activities undertaken within the scope of a joint research agreement as defined in 35 U.S.C. 102(c) or pre-AIA 35 U.S.C. 103(c)(2) and (3), that would raise an issue of double patenting if one of the applications became a patent. See MPEP § 804, subsection I.B.1 for making a "provisional" rejection on the ground of double patenting in such situations. A "provisional" double patenting rejection should continue to be made by the examiner until the rejection has been obviated or is no longer applicable except as noted below. If two (or more) pending applications are filed, in each of which a rejection of one claimed invention over the other on the ground of provisional nonstatutory double patenting (NDP) is proper, the provisional NDP rejection will be made in each application. Where there are three applications containing claims that conflict such that a provisional NDP rejection is made in each application based upon the other two, and it is necessary to file terminal disclaimers to overcome the rejections, it is not sufficient to file a terminal disclaimer in only one of the applications addressing the other two applications. Rather, an appropriate terminal disclaimer must be filed in at least two of the applications to require common ownership or enforcement for all three applications. A terminal disclaimer may be required in each of the three applications in certain situations (e.g., when all three applications have the same effective U.S. filing date). See subsections 1 and 2 below. (b) The filing date of the earliest application for which the application is entitled to the benefit of an earlier filing date under 35 U.S.C. 120, 121, 365(c), or 386(c) as to such conflicting claims. For example, where two applications are entitled to the benefit of the same U.S. nonprovisional application under 35 U.S.C. 120, 121, 365(c), or 386(c), if all the conflicting claims of one of the applications are not appropriately supported in the parent application (and therefore, not entitled to the benefit of the filing date of the parent application), while the conflicting claims of the second application are appropriately supported in the parent application (and therefore, entitled to the benefit of the filing date of the parent application), then the second application has the earlier effective U.S. filing date. Benefit claims under 35 U.S.C. 119(e) and foreign priority claims under 35 U.S.C. 119(a)-(d) or (f), 365(a) or (b), or 386(a) or (b) are not taken into account when determining the term of an issued patent (see 335 U.S.C. 154(a)(2) and (a)(3) ), and therefore, are not taken into account in determining which application is the earliest-filed application. If a provisional nonstatutory double patenting rejection is the only rejection remaining in an application having the earliest effective U.S. filing date (taking into account any benefit under 35 U.S.C. 120, 121, 365(c), or 386(c) with respect to the conflicting claims) compared to the reference application(s), the examiner should withdraw the rejection in the application having the earliest effective U.S. filing date and permit that application to issue as a patent, thereby converting the "provisional" nonstatutory double patenting rejection in the other application(s) into a nonstatutory double patenting rejection when the application with the earliest U.S. effective filing date issues as a patent. If both applications are actually filed on the same day, or are entitled to the same earliest effective filing date taking into account any benefit under 35 U.S.C. 120, 121, 365(c), or 386(c) with respect to the conflicting claims (see subsection 1. Effective U.S. Filing Date, above), the provisional nonstatutory double patenting rejection made in each application should be maintained until the rejection is overcome. Applicant can overcome a provisional nonstatutory double patenting rejection in an application by either filing a reply showing that the claims subject to a provisional nonstatutory double patenting rejection are patentably distinct or filing a terminal disclaimer in the application. If a provisional nonstatutory double patenting rejection is the only rejection remaining in an application, and that application has an effective U.S. filing date (taking into account any benefit claim under 35 U.S.C. 120, 121, 365(c), or 386(c) with respect to the conflicting claims) that is later than the effective U.S. filing date of at least one of the reference application(s), the rejection should be maintained until applicant overcomes the rejection. Provisional nonstatutory double patenting rejections are subject to the requirements of 37 CFR 1.111(b). In accordance with 37 CFR 1.111(b), applicant’s reply must present arguments pointing out the specific distinctions believed to render the claims, including any newly presented claims, patentable over any applied references. Alternatively, a reply that includes the filing of a compliant terminal disclaimer in the later-filed application under 37 CFR 1.321 will overcome a nonstatutory double patenting rejection and is a sufficient reply pursuant to 37 CFR 1.111(b). After the filing of a compliant terminal disclaimer in a pending application, the nonstatutory double patenting rejection will be withdrawn in that application. If a decision by the Patent Trial and Appeal Board does not include an opinion on a provisional nonstatutory double patenting rejection, and includes a reversal of all other grounds as to a claim rejected based on provisional nonstatutory double patenting and the applicant has not filed a proper terminal disclaimer, the examiner must act upon the provisional nonstatutory double patenting rejection. The examiner must first determine if any reference application used in the provisional nonstatutory double patenting rejection has issued as a patent. If the reference application has issued, the provisional rejection should be re-issued as a nonprovisional rejection and a terminal disclaimer should be required, for example, by using form paragraphs 8.33-8.39 as appropriate. See MPEP § 804, subsection II.B. If the reference application has been abandoned or, notwithstanding the discussion in paragraphs (b) and (c) above, where the reference application has not matured to a patent and the provisional double patenting rejection is the only remaining rejection in the application, the examiner should withdraw the provisional rejection. See MPEP § 1214.06. The following form paragraphs may be used to inform the applicant (or patent owner) of the status of a submitted terminal disclaimer. The terminal disclaimer filed on  disclaiming the terminal portion of any patent granted on this application which would extend beyond the expiration date of  has been reviewed and is accepted. The terminal disclaimer has been recorded. 1. In bracket 1, insert the date the terminal disclaimer was filed. 2. In bracket 2, list the Patent Number and/or Application Number (including series code and serial no.). Where an Application Number is listed, it must be preceded by the phrase --any patent granted on Application Number--. 3. See MPEP § 1490 for discussion of requirements for a proper terminal disclaimer. 4. Use form paragraph 14.23.01 for reexamination proceedings. 5. For improper terminal disclaimers, see form paragraphs 14.24 et seq. The terminal disclaimer filed on  disclaiming the terminal portion of the patent being reexamined which would extend beyond the expiration date of  has been reviewed and is accepted. The terminal disclaimer has been recorded. 4. For improper terminal disclaimers, see the form paragraphs which follow. The terminal disclaimer filed on  disclaiming the terminal portion of any patent granted on this application which would extend beyond the expiration date of  has been reviewed and is NOT accepted. 3. One or more of the appropriate form paragraphs 14.26 to 14.32 MUST follow this form paragraph to indicate why the terminal disclaimer is not accepted. 4. Form paragraph 14.35 may be used to inform applicant that an additional disclaimer fee will not be required for the submission of a replacement or supplemental terminal disclaimer. 5. Do not use in reexamination proceedings; use form paragraph 14.25 instead. The terminal disclaimer filed on  disclaiming the terminal portion of the patent being reexamined which would extend beyond the expiration date of  has been reviewed and is NOT accepted. 2. In bracket 2, list the Patent Number and/or the Application Number (including series code and serial no.). Where an Application Number is listed, it must be preceded by the phrase --any patent granted on Application Number--. 1. This form paragraph MUST be preceded by form paragraph 14.24 or 14.25 and followed by one or more of the appropriate form paragraphs 14.26.01 to 14.27.03. The person who has signed the disclaimer has not stated the extent of the applicant's or assignee’s interest in the application/patent. See 37 CFR 1.321(b)(3). This form paragraph MUST be preceded by form paragraph 14.24 or 14.25 AND form paragraph 14.26. It is directed to a particular claim or claims, which is not acceptable, since "the disclaimer must be of a terminal portion of the term of the entire [patent or] patent to be granted." See MPEP § 1490. The terminal disclaimer was not signed. 1. This form paragraph MUST be preceded by form paragraph 14.24 or 14.25 AND form paragraph 14.26. The application/patent being disclaimed has not been identified. The application/patent being disclaimed has been improperly identified since the number used to identify the  being disclaimed is incorrect. The correct number is . 2. In bracket 1, insert --application-- or --patent--. 3. In bracket 2, insert the correct Application Number (including series code and serial no.) or the correct Patent Number being disclaimed. 4. A terminal disclaimer is acceptable if it includes the correct Patent Number or the correct Application Number or the serial number together with the proper filing date or the proper series code. This application was filed before September 16, 2012. The terminal disclaimer was not signed by all owners and, therefore, supplemental terminal disclaimers are required from the remaining owners. 2. Do not use this form paragraph in an application filed on or after September 16, 2012. The disclaimer fee of $  in accordance with 37 CFR 1.20(d) has not been submitted, nor is there any authorization in the application file to charge a specified Deposit Account or credit card. 1. In bracket 1, insert the fee for a disclaimer. 2. This form paragraph MUST be preceded by form paragraph 14.24 or 14.25 AND form paragraph 14.26. If the disclaimer fee was paid for a terminal disclaimer which was not accepted, applicant does not have to pay another disclaimer fee when submitting a replacement or supplemental terminal disclaimer, and this form paragraph should not be used. This application was filed on or after September 16, 2012. The person who signed the terminal disclaimer is not the applicant, the patentee or an attorney or agent of record. See 37 CFR 1.321(a) and (b). 2. Do not use this form paragraph in an application filed before September 16, 2012. This application was filed on or after September 16, 2012. The person who signed the terminal disclaimer has failed to state in what capacity it was signed on behalf of the juristic entity, and the person who signed it has not been established as being authorized to act on behalf of the juristic entity. This application was filed on or after September 16, 2012. The party identified in the terminal disclaimer is not the applicant of record. A request to change the applicant under 37 CFR 1.46(c) must be filed and must include an application data sheet specifying the applicant in the applicant information section and comply with 37 CFR 3.71 and 3.73. To be reconsidered, the terminal disclaimer must be filed with the request under 37 CFR 1.46(c). It does not include a recitation that any patent granted shall be enforceable only for and during such period that said patent is commonly owned with the application(s) or patent(s) which formed the basis for the double patenting rejection. See 37 CFR 1.321(c)(3). 1. For applications filed before September 16, 2012, this form paragraph MUST be preceded by form paragraph 14.24 or 14.25 AND form paragraph 14.26, and should be followed by either form paragraph 14.27.07.fti or form paragraph 14.27.08. 2. For applications filed on or after September 16, 2012, this form paragraph MUST be preceded by form paragraph 14.24 or 14.25 AND form paragraph 14.26, and should be followed by either form paragraph 14.27.07.1 or form paragraph 14.27.08. It fails to disclaim the terminal portion of any patent granted on the subject application. 2. Use this form paragraph when the period disclaimed is not the correct period or when no period is specified at all. 3. When using this form paragraph, give an example of proper terminal disclaimer language using form paragraph 14.27.04.fti (for applications filed before September 16, 2012) or form paragraph 14.27.04.1 (for applications filed on or after September 16, 2012) following this or the series of statements concerning the defective terminal disclaimer. It fails to disclaim the terminal portion of the subject patent. 2. Use this form paragraph in a reissue application or reexamination proceeding when the period disclaimed is not the correct period or when no period is specified at all. The owner, _________________, of _____ percent interest in the instant application hereby disclaims the terminal part of the statutory term of any patent granted on the instant application which would extend beyond the expiration date of the full statutory term of any patent granted on pending reference application Number ________________, filed on _____________, as the term of any patent granted on said reference application may be shortened by any terminal disclaimer filed prior to the grant of any patent on the pending reference application. The owner hereby agrees that any patent so granted on the instant application shall be enforceable only for and during such period that it and any patent granted on the reference application are commonly owned. This agreement runs with any patent granted on the instant application and is binding upon the grantee, its successors or assigns. The owner, _________________, of _____ percent interest in the instant application hereby disclaims the terminal part of the statutory term of any patent granted on the instant application which would extend beyond the expiration date of the full statutory term of patent No. ________________ (the "reference patent") as the term of said reference patent is presently shortened by any terminal disclaimer. The owner hereby agrees that any patent so granted on the instant application shall be enforceable only for and during such period that it and the reference patent are commonly owned. This agreement runs with any patent granted on the instant application and is binding upon the grantee, its successors or assigns. Alternatively, Form PTO/SB/25 may be used for situation I, and Form PTO/SB/26 may be used for situation II. A copy of the forms may be found at the end of MPEP § 1490. 1. This form paragraph may be used in an application filed before September 16, 2012. 2. To provide examples of acceptable terminal disclaimer language in a patent (e.g., for a reexamination situation), other than for a terminal disclaimer based on activities undertaken within the scope of a joint research agreement, use form paragraph 14.27.06. 3. To provide examples of acceptable terminal disclaimer language for a terminal disclaimer based on activities undertaken within the scope of a joint research agreement, (a) use form paragraph 14.27.07.fti for making the disclaimer of the terminal portion of a patent to be granted on an application (generally, an application being examined), and (b) use form paragraph 14.27.08 for making the disclaimer of the terminal portion of an existing patent (e.g., for a reexamination situation). The applicant, ________________, owner of ____ percent interest in the instant application hereby disclaims the terminal part of the statutory term of any patent granted on the instant application which would extend beyond the expiration date of the full statutory term of any patent granted on pending reference application Number ______________, filed on ____________, as the term of any patent granted on said reference application may be shortened by any terminal disclaimer filed prior to the grant of any patent on the pending reference application. The applicant hereby agrees that any patent so granted on the instant application shall be enforceable only for and during such period that it and any patent granted on the reference application are commonly owned. This agreement runs with any patent granted on the instant application and is binding upon the grantee, its successors or assigns. The applicant, ________________, owner of ____ percent interest in the instant application hereby disclaims the terminal part of the statutory term of any patent granted on the instant application which would extend beyond the expiration date of the full statutory term of reference patent No. ________________ as the term of said reference patent is presently shortened by any terminal disclaimer. The applicant hereby agrees that any patent so granted on the instant application shall be enforceable only for and during such period that it and the reference patent are commonly owned. This agreement runs with any patent granted on the instant application and is binding upon the grantee, its successors or assigns. Alternatively, Form PTO/AIA/25 may be used for situation I, and Form PTO/AIA/26 may be used for situation II. A copy of the forms may be found at the end of MPEP § 1490. 1. To provide examples of acceptable terminal disclaimer language in a patent (e.g., for a reexamination situation), other than for a terminal disclaimer based on activities undertaken within the scope of a joint research agreement, use form paragraph 14.27.06. 2. To provide examples of acceptable terminal disclaimer language for a terminal disclaimer based on activities undertaken within the scope of a joint research agreement, (a) use form paragraph 14.27.07.1 for making the disclaimer of the terminal portion of a patent to be granted on an application (generally, an application being examined), and (b) use form paragraph 14.27.08 for making the disclaimer of the terminal portion of an existing patent (e.g., for a reexamination situation). The patentee, ___________, owner of __________ percent interest in the instant patent hereby disclaims the terminal part of the statutory term of the instant patent, which would extend beyond the expiration date of the full statutory term of any patent granted on pending reference application No. ______________, filed on ______________, as the term of any patent granted on said reference application may be shortened by any terminal disclaimer filed prior to the grant of any patent on the pending reference application. The patentee hereby agrees that the instant patent shall be enforceable only for and during such period that the instant patent and any patent granted on the reference application are commonly owned. This agreement is binding upon the patentee, its successors, or assigns. The patentee, ___________, owner of ________ percent interest in the instant patent hereby disclaims the terminal part of the statutory term of the instant patent, which would extend beyond the expiration date of the full statutory term of reference patent No. ______________ as the term of said reference patent is presently shortened by any terminal disclaimer. The patentee hereby agrees that the instant patent shall be enforceable only for and during such period that the instant patent and the reference patent are commonly owned. This agreement is binding upon the patentee, its successors, or assigns. Alternatively, Form PTO/SB/25a may be used for situation I, and Form PTO/SB/26a may be used for situation II. A copy of the forms may be found at the end of MPEP § 1490. 1. To provide examples of acceptable terminal disclaimer language in a patent to be granted on an application (generally, an application being examined), other than for a terminal disclaimer based on activities undertaken within the scope of a joint research agreement, use form paragraph 14.27.04.fti (for applications filed before September 16, 2012) or form paragraph 14.27.04.1 (for applications filed on or after September 16, 2012). 2. To provide examples of acceptable terminal disclaimer language for a terminal disclaimer based on activities undertaken within the scope of a joint research agreement, (a) use form paragraph 14.27.07.fti (for applications filed before September 16, 2012) or form paragraph 14.27.07.1 (for applications filed on or after September 16, 2012) for making the disclaimer of the terminal portion of a patent to be granted on an application (generally, an application being examined), and (b) use form paragraph 14.27.08 for making the disclaimer of the terminal portion of an existing patent (e.g., for a reexamination situation). The owner, __________________, of _______ percent interest in the instant application hereby disclaims the terminal part of the statutory term of any patent granted on the instant application which would extend beyond the expiration date of the full statutory term of any patent granted on pending reference application Number ______________, filed on ______________, as the term of any patent granted on said reference application may be shortened by any terminal disclaimer filed prior to the grant of any patent on the pending reference application. The owner of the instant application waives the right to separately enforce any patent granted on the instant application and any patent granted on the reference application. The owner of the instant application hereby agrees that any patent granted on the instant application and any patent granted on the reference application shall be enforceable only for and during such period that any patent granted on the instant application and any patent granted on the reference application are not separately enforced. The waiver, and this agreement, run with any patent granted on the instant application and any patent granted on the reference application, and are binding upon the owner of the instant application, its successors, or assigns. The owner, __________________, of _______ percent interest in the instant application hereby disclaims the terminal part of the statutory term of any patent granted on the instant application which would extend beyond the expiration date of the full statutory term of reference patent No. _________________, as the term of said reference patent is presently shortened by any terminal disclaimer. The owner of the instant application waives the right to separately enforce the reference patent and any patent granted on the instant application. The owner of the instant application hereby agrees that the reference patent and any patent granted on the instant application shall be enforceable only for and during such period that the reference patent and any patent granted on the instant application are not separately enforced. The waiver, and this agreement, run with any patent granted on the instant application and are binding upon the owner of the instant application, its successors, or assigns. 1. To provide examples of acceptable terminal disclaimer language in a patent (e.g., for a reexamination situation) for a terminal disclaimer based on activities undertaken within the scope of a joint research agreement, use form paragraph 14.27.08. 2. To provide examples of acceptable terminal disclaimer language for a terminal disclaimer in a situation other than one based on activities undertaken within the scope of a joint research agreement, (a) use form paragraph 14.27.04.fti (for applications filed before September 16, 2012) or form paragraph 14.27.04.1 (for applications filed on or after September 16, 2012) for making the disclaimer of the terminal portion of a patent to be granted on an application (generally, an application being examined), and (b) use form paragraph 14.27.06 for making the disclaimer of the terminal portion of an existing patent (e.g., for a reexamination situation). The applicant, __________________, owner of _______ percent interest in the instant application hereby disclaims the terminal part of the statutory term of any patent granted on the instant application which would extend beyond the expiration date of the full statutory term of any patent granted on pending reference application Number ______________, filed on ______________, as the term of any patent granted on said reference application may be shortened by any terminal disclaimer filed prior to the grant of any patent on the pending reference application. The applicant of the instant application waives the right to separately enforce any patent granted on the instant application and any patent granted on the reference application. The applicant of the instant application hereby agrees that any patent granted on the instant application and any patent granted on the reference application shall be enforceable only for and during such period that any patent granted on the instant application and any patent granted on the reference application are not separately enforced. The waiver, and this agreement, run with any patent granted on the instant application and any patent granted on the reference application, and are binding upon the applicant of the instant application, its successors, or assigns. The applicant, __________________, owner of _______ percent interest in the instant application hereby disclaims the terminal part of the statutory term of any patent granted on the instant application which would extend beyond the expiration date of the full statutory term of reference patent No. _________________, as the term of said reference patent is presently shortened by any terminal disclaimer. The applicant of the instant application waives the right to separately enforce the reference patent and any patent granted on the instant application. The applicant of the instant application hereby agrees that the reference patent and any patent granted on the instant application shall be enforceable only for and during such period that the reference patent and any patent granted on the instant application are not separately enforced. The waiver, and this agreement, run with any patent granted on the instant application and are binding upon the applicant of the instant application, its successors, or assigns. 2. To provide examples of acceptable terminal disclaimer language for a terminal disclaimer in a situation other than one based on activities undertaken within the scope of a joint research agreement, (a) use form paragraph 14.27.04.1 for making the disclaimer of the terminal portion of a patent to be granted on an application (generally, an application being examined), and (b) use form paragraph 14.27.06 for making the disclaimer of the terminal portion of an existing patent (e.g., for a reexamination situation). The patentee, ______________, owner of _______ percent interest in the instant patent hereby disclaims the terminal part of the statutory term of the instant patent, which would extend beyond the expiration date of the full statutory term of any patent granted on pending reference Application Number ______________, filed on ______________, as the term of any patent granted on said reference application may be shortened by any terminal disclaimer filed prior to the grant of any patent on the pending reference application. The patentee waives the right to separately enforce the instant patent and any patent granted on the pending reference application. The patentee agrees that the instant patent and any patent granted on the pending reference application shall be enforceable only for and during such period that the instant patent and the patent granted on the pending reference application are not separately enforced. The waiver and this agreement run with the instant patent and are binding upon the patentee, its successors, or assigns. The patentee, owner of _______ percent interest in the instant patent hereby disclaims the terminal part of the statutory term of the instant patent, which would extend beyond the expiration date of the full statutory term of reference patent No. _________________, as the term of said reference patent is presently shortened by any terminal disclaimer. The patentee waives the right to separately enforce the instant patent and the reference patent. The patentee agrees that the instant patent and the reference patent shall be enforceable only for and during such period that the instant patent and the reference patent are not separately enforced. The waiver and this agreement run with the instant patent and are binding upon the patentee, its successors, or assigns. 1. To provide examples of acceptable terminal disclaimer language in a patent to be granted on an application (generally, an application being examined) for a terminal disclaimer based on activities undertaken within the scope of a joint research agreement, use form paragraph 14.27.07.fti (for applications filed before September 16, 2012) or form paragraph 14.27.07.1 (for applications filed on or after September 16, 2012). This application was filed before September 16, 2012. The person who signed the terminal disclaimer has failed to state in what capacity it was signed on behalf of the corporation, or other business entity or organization, and the person who signed it has not been established as being authorized to act on behalf of the assignee. This application was filed before September 16, 2012. The person who signed the terminal disclaimer is not an attorney or agent of record, is not recognized as an officer of the assignee, and has not been established as being authorized to act on behalf of the assignee. See MPEP § 324. 1. 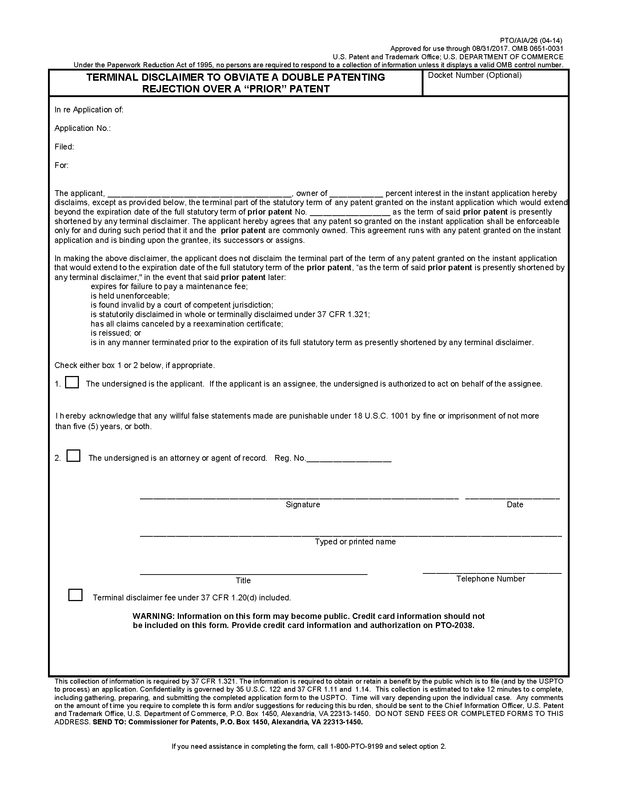 This form paragraph is to be used ONLY in applications filed before September 16, 2012 when the person signing the terminal disclaimer is not an authorized officer as defined in MPEP § 324 or is an attorney or agent not of record (e.g., acting in a representative capacity under 37 CFR 1.34 ). 2. This form paragraph MUST be preceded by form paragraph 14.24 or 14.25 and followed by form paragraph 14.29.02.fti when appropriate. An attorney or agent of record is authorized to sign the terminal disclaimer, even though there is no indication that the attorney or agent is an officer of the assignee. 3. Use form paragraph 14.29.02.fti to explain how an official, other than a recognized officer, may properly sign a terminal disclaimer. This application was filed before September 16, 2012. It would be acceptable for a person, other than a recognized officer, to sign a terminal disclaimer, provided the record for the application includes a statement that the person is empowered to sign terminal disclaimers and/or act on behalf of the assignee. Accordingly, a new terminal disclaimer which includes the above empowerment statement will be considered to be signed by an appropriate official of the assignee. A separately filed paper referencing the previously filed terminal disclaimer and containing a proper empowerment statement would also be acceptable, if filed with another copy of the previously filed terminal disclaimer. 1. This form paragraph MUST be preceded by form paragraph 14.24 or 14.25 AND form paragraph 14.29.fti. 2. When form paragraph 14.29.fti is used to indicate that a terminal disclaimer is denied because it was not signed by a recognized officer nor by an attorney or agent of record, this form paragraph should be used to point out one way to correct the problem. 3. While an indication of the person’s title is desirable, its inclusion is not mandatory when this option is employed. 4. A sample terminal disclaimer should be sent with the Office action. This application was filed before September 16, 2012. The assignee has not established its ownership interest in the application, in order to support the terminal disclaimer. There is no submission in the record establishing the ownership interest by either (a) providing documentary evidence of a chain of title from the original inventor(s) to the assignee and a statement affirming that the documentary evidence of the chain of title from the original owner to the assignee was, or concurrently is being, submitted for recordation pursuant to 37 CFR 3.11, or (b) specifying (by reel and frame number) where such documentary evidence is recorded in the Office (37 CFR 3.73 ). 1. This form paragraph MUST be preceded by form paragraph 14.24 or 14.25. 2. Where an attorney or agent of record signs a terminal disclaimer, there is no need to provide a statement under 37 CFR 3.73. Thus, this form paragraph should not be used. 3. It should be noted that the documentary evidence or the specifying of reel and frame number may be found in the terminal disclaimer itself or in a separate paper. The assignee has not established its ownership interest in the patent, in order to support the terminal disclaimer. There is no submission in the record establishing the ownership interest by either: (a) providing documentary evidence of a chain of title from the original inventor(s) to the assignee and a statement affirming that the documentary evidence of the chain of title from the original owner to the assignee was, or concurrently is being, submitted for recordation pursuant to 37 CFR 3.11; or (b) specifying (by reel and frame number) where such documentary evidence is recorded in the Office (37 CFR 3.73 ). 3. It should be noted that the documentary evidence or the specifying of reel and frame number may be found in the terminal disclaimer itself or in a separate paper in the application. This application was filed before September 16, 2012. The submission establishing the ownership interest of the assignee is informal. There is no indication of record that the party who signed the submission establishing the ownership interest is authorized to sign the submission (37 CFR 3.73 ). 2. Where an attorney or agent of record signs a terminal disclaimer, there is no need to provide any statement under 37 CFR 3.73. Thus, this form paragraph should not be used. 3. This form paragraph should be followed by one of form paragraphs 14.16.02 or 14.16.03. In rare situations where BOTH form paragraphs 14.16.02 and 14.16.03 do not apply and thus cannot be used, the examiner should instead follow this form paragraph with a detailed statement of why there is no authorization to sign. 4. Use form paragraph 14.16.06 to point out one way to correct the problem. 5. Do not use this form paragraph in an application filed on or after September 16, 2012. The application/patent which forms the basis for the double patenting rejection is not identified in the terminal disclaimer. 2. Use this form paragraph when no information is presented. If incorrect information is contained in the terminal disclaimer, use form paragraphs 14.26 and 14.26.05. 37 CFR 3.73 Establishing right of assignee to take action. (a) The original applicant is presumed to be the owner of an application for an original patent, and any patent that may issue therefrom, unless there is an assignment. The original applicant is presumed to be the owner of a trademark application or registration, unless there is an assignment. (2) A statement specifying where documentary evidence of a chain of title from the original owner to the assignee is recorded in the assignment records of the Office (e.g., reel and frame number). (ii) Each assignee submits a statement identifying the parties including inventors who together own the entire right, title and interest and stating that all the identified parties owns the entire right, title and interest. (3) If two or more purported assignees file conflicting statements under paragraph (c)(1) of this section, the Director will determine while, if any, purported assignees will be permitted to control prosecution of the application. (3) For patent matters only, being signed by a practitioner of record. Pre-AIA 37 CFR 3.73 Establishing right of assignee to take action. The assignment document filed on  is not acceptable as the documentary evidence required by 37 CFR 3.73. The submission of the documentary evidence was not accompanied by a statement affirming that the documentary evidence of the chain of title from the original owner to the assignee was, or concurrently is being, submitted for recordation pursuant to 37 CFR 3.11. See 37 CFR 3.11 and MPEP § 302. 1. In bracket 1, insert the date the assignment document was filed. 2. 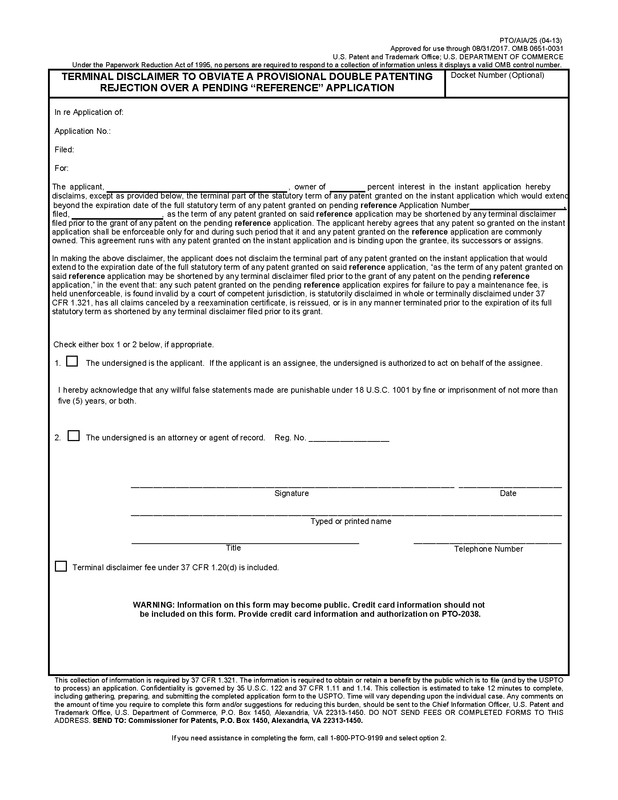 This form paragraph should be used when an assignment document (an original, facsimile, or copy) is submitted to satisfy 37 CFR 3.73 was not accompanied by a statement affirming that the documentary evidence of the chain of title from the original owner to the assignee was, or concurrently is being, submitted for recordation, and the documentary evidence has not been recorded among the assignment records of the Office. It should be noted that applicant is not required to pay another disclaimer fee as set forth in 37 CFR 1.20(d) when submitting a replacement or supplemental terminal disclaimer. 1. This form paragraph can be used to notify an applicant that another disclaimer fee will not be required when a replacement or supplemental terminal disclaimer is submitted. 2. Use form paragraph 14.35.01 for providing notification to patent owner, rather than an applicant. It should be noted that patent owner is not required to pay another disclaimer fee as set forth in 37 CFR 1.20(d) when submitting a replacement or supplemental terminal disclaimer. This form paragraph can be used to notify a patent owner that another disclaimer fee will not be required when a replacement or supplemental terminal disclaimer is submitted. Since the required fee for the terminal disclaimer was previously paid, applicant’s payment of an additional terminal disclaimer fee is not required. Applicant may request a refund of this additional terminal disclaimer fee by submitting a written request for a refund and a copy of this Office action to: Mail Stop 16, Director of the United States Patent and Trademark Office, P.O. Box 1450, Alexandria, Virginia 22313-1450. 1. This form paragraph should be used to notify applicant that a refund can be obtained if another terminal disclaimer fee was paid when a replacement or supplemental terminal disclaimer was submitted. 2. Note - If applicant has authorized or requested a fee refund to be credited to a specific Deposit Account or credit card, then an appropriate credit should be made to that Deposit Account or credit card and this paragraph should NOT be used. 3. Use form paragraph 14.36.01 for providing notification to patent owner, rather than an applicant. Since the required fee for the terminal disclaimer was previously paid, patent owner’s payment of an additional terminal disclaimer fee is not required. Patent owner may request a refund of this additional terminal disclaimer fee by submitting a written request for a refund and a copy of this Office action to: Mail Stop 16, Director of the United States Patent and Trademark Office, P.O. Box 1450, Alexandria, Virginia 22313-1450. 1. This form paragraph should be used to notify patent owner that a refund can be obtained if another terminal disclaimer fee was paid when a replacement or supplemental terminal disclaimer was submitted. 2. Note - If patent owner has authorized or requested a fee refund to be credited to a specific Deposit Account or credit card, then an appropriate credit should be made to that Deposit Account or credit card and this form paragraph should NOT be used. A terminal disclaimer may be effective to overcome a provisional nonstatutory double patenting rejection over a pending application (37 CFR 1.321(b) and (c) ). The USPTO Internet website contains terminal disclaimer forms which may be used. Please visit www.uspto.gov/patent/patent-forms. The filing date of the application will determine what form should be used. A web-based eTerminal Disclaimer may be filled out completely online using web-screens. An eTerminal Disclaimer that meets all requirements is auto-processed and approved immediately upon submission. For more information about eTerminal Disclaimers, refer to www.uspto.gov/patents/process/file/efs/guidance/eTD-info-I.jsp. This form paragraph can be used to provide applicant information regarding the terminal disclaimer forms available on the USPTO website that may be used to overcome a provisional nonstatutory double patenting rejection over a pending application. A terminal disclaimer may be effective to overcome a nonstatutory double patenting rejection over a reference patent (37 CFR 1.321(b) and (c) ). This form paragraph can be used to provide applicant information regarding the terminal disclaimer forms available on the USPTO website that may be used to overcome a nonstatutory double patenting rejection over a reference patent. If timely requested, a recorded terminal disclaimer may be withdrawn before the application in which it is filed issues as a patent, or if a terminal disclaimer is filed in a reexamination proceeding, before the reexamination certificate issues. After a patent or reexamination certificate issues, a recorded terminal disclaimer will not be nullified. While the filing and recordation of an unnecessary terminal disclaimer has been characterized as an "unhappy circumstance" in In re Jentoft, 392 F.2d 633, 157 USPQ 363 (CCPA 1968), there is no statutory prohibition against nullifying or otherwise canceling the effect of a recorded terminal disclaimer which was erroneously filed before the patent issues. Likewise, a terminal disclaimer that was erroneously filed in a reexamination proceeding may be withdrawn before issuance of the reexamination certificate. Because the terminal disclaimer would not take effect until the patent is granted (or the reexamination certificate is published), and the public has not had the opportunity to rely on the terminal disclaimer, relief from this unhappy circumstance may be available by way of petition or by refiling the application (other than by refiling it as a CPA). Under appropriate circumstances, consistent with the orderly administration of the examination process, the nullification of an erroneously filed recorded terminal disclaimer may be addressed by filing a petition under 37 CFR 1.182 requesting withdrawal of the recorded terminal disclaimer. Petitions seeking to reopen the question of the propriety of the double patenting rejection that prompted the filing of the terminal disclaimer have not been favorably considered. The filing of a continuing application other than a CPA, while abandoning the application in which the terminal disclaimer has been filed, will typically nullify the effect of a terminal disclaimer. The filing of a Request for Continued Examination (RCE) of an application under 37 CFR 1.114 will not nullify the effect of a terminal disclaimer, because a new application has not been filed, but rather prosecution has been continued in the existing application. The mechanisms to correct a patent — certificate of correction (35 U.S.C. 255 ), reissue (35 U.S.C. 251 ), reexamination (35 U.S.C. 305 and pre-AIA 35 U.S.C. 314 ), inter partes review (35 U.S.C. 316 ), post grant review (35 U.S.C. 326 ), and covered business method review — are not available to withdraw or otherwise nullify the effect of a recorded terminal disclaimer. As a general principle, public policy does not favor the restoration to the patent owner of something that has been freely dedicated to the public, particularly where the public interest is not protected in some manner — e.g., intervening rights in the case of a reissued patent. See, e.g., Altoona Publix Theatres v. American Tri-Ergon Corp., 294 U.S. 477, 24 USPQ 308 (1935). (C) of a minor character. A mistake in filing a terminal disclaimer does not fall within any of the categories of mistake for which a certificate of correction of applicant’s mistake is permissible. Although the remedial nature of reissue (35 U.S.C. 251 ) is well recognized, reissue is not available to correct all errors. Reissue is not available to withdraw or otherwise nullify the effect of a terminal disclaimer recorded in an issued patent. First, the reissue statute only authorizes the Director of the USPTO to reissue a patent "for the unexpired part of the term of the original patent." Because the granting of a reissued patent without the effect of a recorded terminal disclaimer would result in extending the term of the original patent, reissue under these circumstances would be contrary to the statute. In In re Yamazaki, 702 F.3d 1327, 1332, 104 USPQ2d 2024, 2028 (Fed. Cir. 2012), the Federal Circuit stated, as to a terminal disclaimer submitted for a patent, that the statutory patent term calculation begins but does not end with 35 U.S.C. 154(a). When a patent issues subject to a terminal disclaimer, the patentee has reduced the patent’s statutory term by effectively eliminating the disclaimed portion from the original patent, by operation of 35 U.S.C. 253 (which indicates that a disclaimer of patent claims "shall thereafter be considered as part of the original patent" and such applies to disclaimers of patent term). Id. Second, the principle against recapturing previously patented subject matter that has been intentionally dedicated to the public dates back to Leggett v. Avery, 101 U.S. 256 (1879). The attempt to restore that portion of the patent term that was dedicated to the public to secure the grant of the original patent would be contrary to this recapture principle. Finally, applicants have the opportunity to challenge the need for a terminal disclaimer during the prosecution of the application that issues as a patent. "Reissue is not a substitute for Patent Office appeal procedures." Ball Corp. v. United States, 729 F.2d 1429, 1435, 221 USPQ 289, 293 (Fed. Cir. 1984). Where applicants did not challenge the propriety of the examiner’s nonstatutory double patenting rejection, but filed a terminal disclaimer to avoid the rejection, the filing of the terminal disclaimer did not constitute error within the meaning of 35 U.S.C. 251. Ex parte Anthony, 230 USPQ 467 (Bd. App. 1982), aff’d, No. 84-1357 (Fed. Cir. June 14, 1985). In In re Dinsmore, 757 F.3d 1343, 111 USPQ2d 1229 (Fed. Cir. 2014), the Federal Circuit held that the filing of a terminal disclaimer to obviate a double patenting rejection over a prior patent, when the prior patent and the patent sought to be reissued were never commonly owned, was not an error within the meaning of the reissue statute. In rejecting applicants' argument, the Dinsmore court noted that applicants had not shown a mistaken belief that the two patents at issue were commonly owned, and stated that the applicants were ultimately seeking to revise a choice they made, not to remedy the result of a mistaken belief. Finally, the nullification of a recorded terminal disclaimer would not be appropriate in reexamination, inter partes review, post grant review, and covered business method review proceedings. There are statutory prohibitions in 35 U.S.C. 305 and pre-AIA 35 U.S.C. 314, 35 U.S.C. 316, and 35 U.S.C. 326 against enlarging the scope of a claim during reexamination, inter partes review, post grant review, and covered business method review proceedings. As noted by the Board in Anthony, supra, if a terminal disclaimer was nullified, "claims would be able to be sued upon for a longer period than would the claims of the original patent. Therefore, the vertical scope, as opposed to the horizontal scope (where the subject matter is enlarged), would be enlarged." Id. at 470. Accordingly, after issuance of a patent, a request to replace or remove a previously recorded terminal disclaimer will not be addressed on the merits. Where a terminal disclaimer was submitted to overcome a nonstatutory double patenting rejection (made during prosecution of an application which has now issued as a patent), and one or more patent or application numbers for the patent(s) or application(s) being disclaimed in the terminal disclaimer were in error, the patent owner may file a paper explaining the error(s) and requesting that the explanation be included in the file history and its request acknowledged. A patent owner may file additional terminal disclaimer(s) disclaiming the correct patent(s) or application(s) accompanied by the fee for such disclaimer(s) for processing by the Office. See subsection IV above. The following are forms which may be used when filing a terminal disclaimer. Forms PTO/AIA/25 and PTO/AIA/26 may be used when filing a terminal disclaimer in an application where the application in which the terminal disclaimer is submitted was filed on or after September 16, 2012. Forms PTO/SB/25 and PTO/SB/26 may be used when filing a terminal disclaimer in an application where the application in which the terminal disclaimer is submitted was filed before September 16, 2012. Forms PTO/SB/25a and PTO/SB/26a may be used when filing a terminal disclaimer in a patent.